We went out on the cold and rainy Sunday for the original final night of the Osborne Lights at Disney’s Hollywood studios January 3rd, 2016. Low crowds because it rained all evening and was very cold; only around 48f. At the last-minute they announced three additional days of the Lights with a final day of Wednesday, January 6, 2016 but the group who braved the weather on Sunday had a really great vibe. We were dedicated and true fans and everyone had even more fun in a weird way for being there in the miserable conditions. 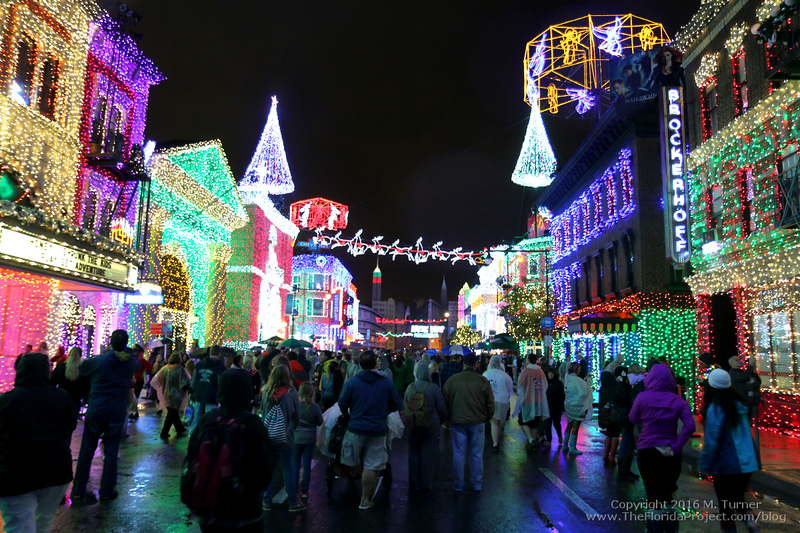 Here’s a view of the soggy but low volume crowds on Streets of America under the Osborne Family Spectacle of Dancing Lights.